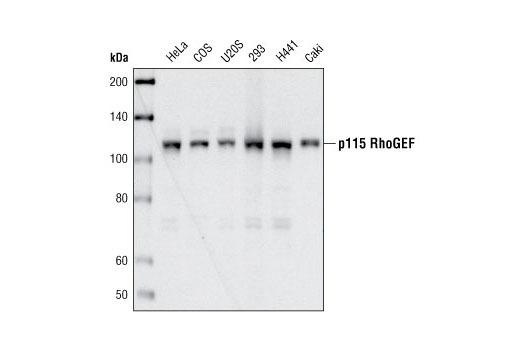 Western blot analysis of extracts from various cell types using p115 RhoGEF (D25D2) XP® Rabbit mAb. Immunoprecipitation of p115 RhoGEF from COS cells using p115 RhoGEF (D25D2) XP® Rabbit mAb. Western blot was preformed using the same antibody. Lane 1 is 5% input. 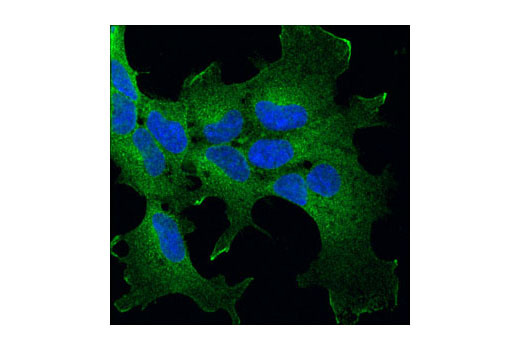 Confocal immunofluorescent analysis of HEK/293 cells using p115 RhoGEF (D25D2) XP® Rabbit mAb (green). Blue pseudocolor = DRAQ5® (fluorescent DNA dye). 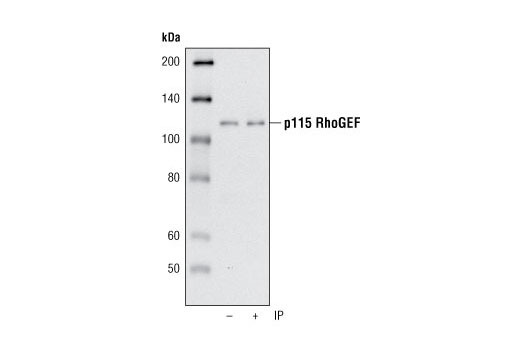 p115 RhoGEF (D25D2) XP® Rabbit mAb detects endogenous levels of total p115 RhoGEF protein. Monoclonal antibody is produced by immunizing animals with a synthetic peptide corresponding to residues near the amino terminus of human p115 RhoGEF. The Rho family small GTPases, including Rho, Rac and cdc42, act as molecular switches, regulating processes such as cell migration, adhesion, proliferation and differentiation. They are activated by guanine nucleotide exchange factors (GEFs), which catalyze the exchange of bound GDP for GTP, and inhibited by GTPase activating proteins (GAPs), which catalyze the hydrolysis of GTP to GDP. A third level of regulation is provided by the stoichiometric binding of Rho GDP dissociation inhibitor (RhoGDI) (1). G-protein coupled receptors (GPCRs) at the cell surface signal through heteromeric G proteins to small GTPases such as Rho, which then signal to downstream effector molecules (2). p115 RhoGEF/ArhGEF1 and its family members PDZ-RhoGEF (PRG), and LARG are stimulated by heteromeric G proteins and thus couple signaling from GPCRs to Rho small GTPases (3-6). In a mouse model of asthma, p115 RhoGEF is necessary for T cells to enable airway inflammation and hyperreactivity (7). DerMardirossian, C. and Bokoch, G.M. (2005) Trends Cell Biol 15, 356-63. Morris, A.J. and Malbon, C.C. (1999) Physiol Rev 79, 1373-430. Chen, Z. et al. (2003) J Biol Chem 278, 9912-9. Hart, M.J. et al. (1998) Science 280, 2112-4. Kozasa, T. et al. (1998) Science 280, 2109-11. Bhattacharyya, R. and Wedegaertner, P.B. (2003) Biochem J 371, 709-20. Brown, J.P. et al. (2007) Am J Respir Crit Care Med 176, 10-9.